Error:Execution failed for task ‘:lomeal:compileRetrolambdaDebug’. Back in the semi-olden days, when Unix was being invented and K&R were writing The C Programming Language, everything was very simple. EBCDIC was on its way out. The only characters that mattered were good old unaccented English letters, and we had a code for them called ASCIIwhich was able to represent every character using a number between 32 and 127. Space was 32, the letter “A” was 65, etc. This could conveniently be stored in 7 bits. Most computers in those days were using 8-bit bytes, so not only could you store every possible ASCII character, but you had a whole bit to spare, which, if you were wicked, you could use for your own devious purposes: the dim bulbs at WordStar actually turned on the high bit to indicate the last letter in a word, condemning WordStar to English text only. Codes below 32 were called unprintable and were used for cussing. Just kidding. They were used for control characters, like 7 which made your computer beep and 12 which caused the current page of paper to go flying out of the printer and a new one to be fed in. Because bytes have room for up to eight bits, lots of people got to thinking, “gosh, we can use the codes 128-255 for our own purposes.” The trouble was,lots of people had this idea at the same time, and they had their own ideas of what should go where in the space from 128 to 255. 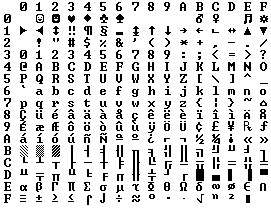 The IBM-PC had something that came to be known as the OEM character set which provided some accented characters for European languages and a bunch of line drawing characters… horizontal bars, vertical bars, horizontal bars with little dingle-dangles dangling off the right side, etc., and you could use these line drawing characters to make spiffy boxes and lines on the screen, which you can still see running on the 8088 computer at your dry cleaners’. In fact as soon as people started buying PCs outside of America all kinds of different OEM character sets were dreamed up, which all used the top 128 characters for their own purposes. For example on some PCs the character code 130 would display as é, but on computers sold in Israel it was the Hebrew letter Gimel ( ), so when Americans would send their résumés to Israel they would arrive asr sum s. In many cases, such as Russian, there were lots of different ideas of what to do with the upper-128 characters, so you couldn’t even reliably interchange Russian documents. Eventually this OEM free-for-all got codified in the ANSI standard. In the ANSI standard, everybody agreed on what to do below 128, which was pretty much the same as ASCII, but there were lots of different ways to handle the characters from 128 and on up, depending on where you lived. These different systems were called code pages. So for example in Israel DOS used a code page called 862, while Greek users used 737. They were the same below 128 but different from 128 up, where all the funny letters resided. The national versions of MS-DOS had dozens of these code pages, handling everything from English to Icelandic and they even had a few “multilingual” code pages that could do Esperanto and Galician on the same computer! Wow!But getting, say, Hebrew and Greek on the same computer was a complete impossibility unless you wrote your own custom program that displayed everything using bitmapped graphics, because Hebrew and Greek required different code pages with different interpretations of the high numbers. Meanwhile, in Asia, even more crazy things were going on to take into account the fact that Asian alphabets have thousands of letters, which were never going to fit into 8 bits. This was usually solved by the messy system called DBCS, the “double byte character set” in whichsome letters were stored in one byte and others took two. It was easy to move forward in a string, but dang near impossible to move backwards. Programmers were encouraged not to use s++ and s– to move backwards and forwards, but instead to call functions such as Windows’ AnsiNext and AnsiPrev which knew how to deal with the whole mess. This platonic A is different than B, and different from a, but the same as A and A and A. The idea that A in a Times New Roman font is the same character as the A in a Helvetica font, but differentfrom “a” in lower case, does not seem very controversial, but in some languages just figuring out what a letter is can cause controversy. Is the German letter ß a real letter or just a fancy way of writing ss? If a letter’s shape changes at the end of the word, is that a different letter? Hebrew says yes, Arabic says no. Anyway, the smart people at the Unicode consortium have been figuring this out for the last decade or so, accompanied by a great deal of highly political debate, and you don’t have to worry about it. They’ve figured it all out already. Every platonic letter in every alphabet is assigned a magic number by the Unicode consortium which is written like this: U+0639. This magic number is called a code point. The U+ means “Unicode” and the numbers are hexadecimal. U+0639 is the Arabic letter Ain. The English letter A would be U+0041. You can find them all using thecharmap utility on Windows 2000/XP or visiting the Unicode web site. There are hundreds of traditional encodings which can only storesome code points correctly and change all the other code points into question marks. Some popular encodings of English text are Windows-1252 (the Windows 9x standard for Western European languages) and ISO-8859-1, aka Latin-1 (also useful for any Western European language). But try to store Russian or Hebrew letters in these encodings and you get a bunch of question marks. UTF 7, 8, 16, and 32 all have the nice property of being able to store any code point correctly. For the latest version of CityDesk, the web site management software published by my company, we decided to do everything internally in UCS-2 (two byte) Unicode, which is what Visual Basic, COM, and Windows NT/2000/XP use as their native string type. In C++ code we just declare strings as wchar_t (“wide char”) instead of char and use the wcs functions instead of the str functions (for example wcscatand wcslen instead of strcat and strlen). To create a literal UCS-2 string in C code you just put an L before it as so: L”Hello”. Abstract class InputStream: clients use this to read data from different sources such as file resources using FileInputStream, internet resources using socket.getInputStream or from an in-memory byte array (ByteArrayInputStream). it has methods of int read() which reads one byte and returns an integer ranging from 0 to 255, returns -1 at the end of the file.it blocks until the end of the stream is reached or an exception is thrown. It has another method of public int read (byte buffer, int byteOffset, int byteCount) which reads they bytes into a buffer array start from the offset value. FileInputStream: subclass of InputStream which reads bytes from a file but doesnt buffer the bytes. it implements the read method in InputStream class. Bufferinputstream wraps the InputStream method, bufferInputStream = new BufferInputStream(inputStream). It will reads the input into the buffer. so if there are frequent access to the data source, it can reduce the access cost. The manifest entry for each type of component element—<activity>, <service>, <receiver>, and<provider>—supports an android:process attribute that can specify a process in which that component should run. You can set this attribute so that each component runs in its own process or so that some components share a process while others do not. You can also set android:process so that components of different applications run in the same process—provided that the applications share the same Linux user ID and are signed with the same certificates. Android might decide to shut down a process at some point, when memory is low and required by other processes that are more immediately serving the user. Application components running in the process that’s killed are consequently destroyed. A process is started again for those components when there’s again work for them to do. When deciding which processes to kill, the Android system weighs their relative importance to the user. For example, it more readily shuts down a process hosting activities that are no longer visible on screen, compared to a process hosting visible activities. The decision whether to terminate a process, therefore, depends on the state of the components running in that process. The rules used to decide which processes to terminate is discussed below. It hosts a Service that’s running “in the foreground”—the service has calledstartForeground(). It hosts a Service that’s executing one of its lifecycle callbacks (onCreate(), onStart(), oronDestroy()). It hosts an Activity that is not in the foreground, but is still visible to the user (its onPause()method has been called). This might occur, for example, if the foreground activity started a dialog, which allows the previous activity to be seen behind it. When an application is launched, the system creates a thread of execution for the application, called “main.” This thread is very important because it is in charge of dispatching events to the appropriate user interface widgets, including drawing events. It is also the thread in which your application interacts with components from the Android UI toolkit (components from the android.widget andandroid.view packages). As such, the main thread is also sometimes called the UI thread. The system does not create a separate thread for each instance of a component. All components that run in the same process are instantiated in the UI thread, and system calls to each component are dispatched from that thread. Consequently, methods that respond to system callbacks (such asonKeyDown() to report user actions or a lifecycle callback method) always run in the UI thread of the process. For instance, when the user touches a button on the screen, your app’s UI thread dispatches the touch event to the widget, which in turn sets its pressed state and posts an invalidate request to the event queue. The UI thread dequeues the request and notifies the widget that it should redraw itself. When your app performs intensive work in response to user interaction, this single thread model can yield poor performance unless you implement your application properly. Specifically, if everything is happening in the UI thread, performing long operations such as network access or database queries will block the whole UI. When the thread is blocked, no events can be dispatched, including drawing events. From the user’s perspective, the application appears to hang. Even worse, if the UI thread is blocked for more than a few seconds (about 5 seconds currently) the user is presented with the infamous “application not responding” (ANR) dialog. The user might then decide to quit your application and uninstall it if they are unhappy. Because of the single thread model described above, it’s vital to the responsiveness of your application’s UI that you do not block the UI thread. If you have operations to perform that are not instantaneous, you should make sure to do them in separate threads (“background” or “worker” threads). At first, this seems to work fine, because it creates a new thread to handle the network operation. However, it violates the second rule of the single-threaded model: do not access the Android UI toolkit from outside the UI thread—this sample modifies the ImageView from the worker thread instead of the UI thread. This can result in undefined and unexpected behavior, which can be difficult and time-consuming to track down. Now this implementation is thread-safe: the network operation is done from a separate thread while theImageView is manipulated from the UI thread. However, as the complexity of the operation grows, this kind of code can get complicated and difficult to maintain. To handle more complex interactions with a worker thread, you might consider using aHandler in your worker thread, to process messages delivered from the UI thread. Perhaps the best solution, though, is to extend the AsyncTask class, which simplifies the execution of worker thread tasks that need to interact with the UI. To use it, you must subclass AsyncTask and implement the doInBackground() callback method, which runs in a pool of background threads. To update your UI, you should implementonPostExecute(), which delivers the result from doInBackground() and runs in the UI thread, so you can safely update your UI. You can then run the task by calling execute() from the UI thread. Now the UI is safe and the code is simpler, because it separates the work into the part that should be done on a worker thread and the part that should be done on the UI thread. Caution: Another problem you might encounter when using a worker thread is unexpected restarts in your activity due to a runtime configuration change (such as when the user changes the screen orientation), which may destroy your worker thread. To see how you can persist your task during one of these restarts and how to properly cancel the task when the activity is destroyed, see the source code for the Shelves sample application. This is primarily true for methods that can be called remotely—such as methods in a bound service. When a call on a method implemented in an IBinder originates in the same process in which theIBinder is running, the method is executed in the caller’s thread. However, when the call originates in another process, the method is executed in a thread chosen from a pool of threads that the system maintains in the same process as the IBinder (it’s not executed in the UI thread of the process). For example, whereas a service’s onBind() method would be called from the UI thread of the service’s process, methods implemented in the object that onBind() returns (for example, a subclass that implements RPC methods) would be called from threads in the pool. Because a service can have more than one client, more than one pool thread can engage the same IBinder method at the same time.IBinder methods must, therefore, be implemented to be thread-safe. Similarly, a content provider can receive data requests that originate in other processes. Although theContentResolver and ContentProvider classes hide the details of how the interprocess communication is managed, ContentProvider methods that respond to those requests—the methodsquery(), insert(), delete(), update(), and getType()—are called from a pool of threads in the content provider’s process, not the UI thread for the process. Because these methods might be called from any number of threads at the same time, they too must be implemented to be thread-safe. I have a Java server and a Java client running on the same network and the applications are not to be used outside a private network (not over internet). So I used a static IP for the server, but what if I deploy my application? What if the network changes? That means I’ll lose my connection to the server and I’ll have to change the IP on the client side again. Now that would be stupid. I want the client to “discover” the server on the network and connect with it. Using UDP packets and broadcasting them! This technique however is not optimal, but as long as we stay in one network this shouldn’t be a problem. UDP packets however are fairly easy to work with. So let’s get started. Still here? Let’s do this! First, Let’s create the Java Singleton class that will execute the code on the server-side. This will be multi-threaded of course, so we’ll also implement “Runnable”. When we implement Runnable, we also have to override the Run method. Ok, let’s think about this. What do we have to do? That’s it on the server side. Now, we’ll translate this into code. A few notes; If you want to use strings as commands (like I do in this example), you have to trim the string before comparing it. There, that’s it for the server. Now we have to write the code for the client. Again, let me sketch how we are going to work. Open a socket on a random port. On a side note, we don’t close the socket on the server because the server will receive and send UPD packets until the server is closed. Closing the socket on the server means that we won’t be able to discover it any more. Wow, that was quite a lot. Now let’s put this into code! // Send the broadcast package! I’ve given you pretty much all of the code, so it shouldn’t be easy to implement. Don’t forget to run your DiscoveryThread! When writing network applications in a stable and controlled environment, it is easy to forget what the real world is like. Slow connections, traffic build ups, or power interruptions can cause network connections to stall or even die. Few programmers take the time to detect and handle network timeouts, but avoiding the problem can cause client applications to freeze, and for threads in servers to block indefinitely. There are, however, easy ways to handle network timeouts. In this article, I’ll present two techniques for overcoming the problem of network timeouts – threads and setting a socket option for timeouts. Handling timeouts is one of those tasks that people generally leave to the last moment. In an ideal world, we’d never need them. In an intranet environment, where most programmers do their development, it’s almost always unnecessary. However, on the Internet, good timeout handling is critical. Badly behaved clients may go offline and leaving server threads locked, or overloaded servers may stall, causing a network client to block indefinitely for input. For these reasons, it is necessary to detect and handle network timeouts. I’ve identified two relatively simple solutions to the problem of handling network timeouts. The first solution involves the use of second thread, which acts as a timer. This solution results in a slight increase in complexity, but is backwards compatible with JDK1.02. The second solution is by far, much simpler. It takes only a few lines of code, by setting a socket option, and catching a timeout exception. The catch is, that it requires a JDK1.1 or higher virtual machine. Many network software (particularly servers), are written as multi-threaded applications. However, a client can also use multiple threads. One solution to handling network timeouts is to launch a secondary thread, the ‘timer’, and have it cancel the application gracefully if it becomes stalled. This prevents end users from becoming confused when the application stalls – a good error message will at least let them know the cause of the problem. Listing One shows a Timer, which can be used in networking applications to handle timeouts gracefully. Once the timer is started, it must be reset regularly, such as when data is returned by a server. However, if the thread that reads from a remote network host becomes stalled, the timer will exit with an error message. For those who require a custom handler, the timeout() method may be overridden to provide different functionality. * timeout() method is called. * the length of the timer in milliseconds. To illustrate the use of the Timer class, here is a simple TCP client (Listing Two) and server (Listing Three). The client sends a text string across the network, and then reads a response. 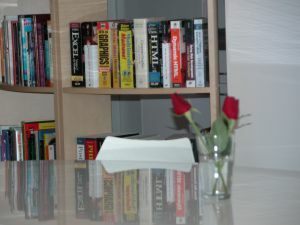 While reading, it would become blocked if the server stalled, or if the server took too long to accept the connection. For this reason, a timer is started before connecting, and then reset after each major operation. Starting the timer is relatively simple, but it must be reset after each blocking operation or the client will terminate. The server is relatively simple – it’s a single-threaded application, which simulates a stalled server. The server reads a response from the client, and echoes it back.To demonstrate timeouts, the server will always “stall” for a period of twenty seconds, on every second connection. Remember though, in real life, server timeouts are entirely unpredictable, and will not always correct themselves after several seconds of delay. * of text, and then reads the echoed text back from the server. * will stall for twenty seconds. A significantly easier solution to handling network timeouts is to set a socket option. Socket options allow programmers greater control over socket communication, and are supported by Java as of JDK1.1. One socket option in particular, SO_TIMEOUT, is extremely useful, because it allows programmers to specify an amount of time that a read operation will block for, before generating anjava.io.InterruptedIOException, which can be easily caught to provide a timeout handler. We can specify a value for SO_TIMEOUT, by using the setSoTimeout() method. This method is supported by java.net.Socket, java.net.DatagramSocket, and java.net.ServerSocket. This is important, as it means we can handle timeouts in both the client and the server. The setSoTimeout accepts as its sole parameter an int, which represents the number of milliseconds an operation may block for. Settings this value to one thousand will result in timeouts after one second of inactivity, whereas setting SO_TIMEOUT to zero will allow the thread to block indefinitely. Once the length for the timeout is set, any blocking operation will cause an InterruptedIOException to be thrown. For example, a DatagramSocket that failed to receive packets when the receive() method is called, would throw an exception. This makes it easy to separate our timeout handling code from the task of communicating via the network. The next example, Listing Four, shows another multi-threaded echo server with timeout support. It limits the number of connections it can support (currently set to two), and rejects further connections. However, if a client fails to send data, a server thread will become blocked, and the number of available connections will be reduced. With larger servers, and hundreds or thousands of connections per hour, blocked threads become a significant problem, and can lead to denial of service. This example shows how to detect a timeout, and to disconnect gracefully. By using socket_options, and catching exceptions, it’s easier to shut down an individual thread. To test the echo server, you can use the telnet command (available on both Unix/Wintel systems), and connect to port 2000 of your local machine. Type a few characters of text, and then watch what happens after thirty seconds of inactivity. The server will automatically disconnect the telnet client, freeing up the connection for another user. * EchoServer offers an echo service to multiple clients. * service the specified client connection. All good network applications will include timeout detection and handling. Whether you’re writing a client, and need to detect a wayward server, or writing a server and need to prevent stalled connections, timeout handling is a critical part of error handling. For those who require backwards compatibility with JDK1.02, timers may be used to detect stalled connections. The most preferable solution though, is to use socket options, and to provide an exception handler for java.io.InterruptedIOException. This reduces the amount of code required to handle timeouts, and makes for a cleaner design. Gang of Four (GoF) Patterns are 23 main software design patterns providing recurring solutions to common problems in software design. They were developed by Erich Gamma, Richard Helm, Ralph Johnson and John Vlissides, often referred to as the Gang of Four. We have started this series to explain each of these patterns with a real world example and how to develop and use them in Java. This is all about object creation in a form that they can follow the architecture principle of loose coupling, encapsulation and abstraction. This pattern can provide a great deal of flexibility about which objects are created, how those objects are created, and how they’re initialized. And the most important thing is that the client remains completely unaware of overall object creation process. This pattern is used to form larger object structures from many different objects. They show you how to use composition to join different pieces of a system together in a flexible and extensible fashion. This pattern help you guarantee that when one of the parts changes, the entire structure doesn’t need to change. They also show you how to recast pieces that don’t fit into pieces that do fit. This pattern is used to manage relationships, interaction, algorithms and responsibilities between various objects. It also follows the abstraction principle whereby it abstracts the action. This pattern focuses on the interaction between the cooperating objects in a manner that the objects are communicating while maintaining loose coupling. The below diagram provides a clear view of the relationship between the above design patterns mentioned.